In the world of technology, most women do not get the recognition that Rear Admiral Dr. Grace Murray Hopper has received. Hopper is the mother of computing. Her development of the first computer compiler and the first computer programming language helped revolutionize the world of computers. Although Hopper had a career decorated with many rewards, she had to prove herself repeatedly. She once said, "If you do something once, people will call it an accident. If you do it twice, they call it a coincidence. But do it a third time and you've just proven a natural law!" She holds honoree doctorates from over thirty universities and many of her writings have influenced programs made today. Perseverance and knowledge are two traits that made her a great leader. She was determined not to let anyone get in the way of her vision of creating a much wider audience for computing. It was unusual for a woman in the 1950's and 1960's to have the kind of job Hopper did. She was outstanding in marketing and had amazing technical skills. Her nickname in the navy was "Amazing Grace." People listened to her because she had the technical skills and the vision. She never gave up on her ideas. These qualities are what put her in the forefront of computing. Hopper had an edge over everyone in the computer business because she believed that there was always a way to improve on the technology. Through her dedication, her knowledge, and her determination she took the world of computers to a new level. Grace Hopper was born in 1906. From an early age, Hopper was good with gadgets. She would take apart alarm clocks just for fun. In 1928, this New York native received her BA. in math and physics from Vassar College. In 1943, during World War II, she joined the United States Naval Reserves. She was assigned to the Bureau of Ordinance Computation Project. There she became the third programmer of the world's first large-scale computer called the Mark I. When she saw it, all she could think about was taking it apart and figuring it out. "That was an impressive beast. She was fifty-one feet long, eight feet high, and five feet deep," said Hopper. She mastered the Mark I, Mark II, and Mark III. While trying to repair the Mark I she discovered a moth caught in a relay. She taped the moth in the log book and from that coined the phrase "a bug in the computer". After her tour of duty, Hopper went on to work for Eckert-Mauchly Corporation. She wanted to provide businesses with computers that were both application-friendly and programmer-friendly. There, she mastered the UNIVAC I, the first large-scale electronic computer. She saw that the programmers would constantly have to retype certain commands for every program they did. Hopper encouraged them to write the commands once and place them in shared libraries of code. This reduced the amount of errors and stress for the programmers. Soon, the programs contained mnemonics that were transformed into binary codes that were executable by the computer. Hopper created a program that translated symbolic math codes into machine language. This allowed the programmers to store codes on magnetic tape and re-call them when they were needed. This was the first compiler. Hopper believed that programming did not have to be a difficult task. Since computers only read binary codes, a series of 0s and 1s placed in a certain order that the computer understands, she believed that programs could be written in English and then translated into binary code. This program was known as FLOW-MATIC. This language helped the UNIVAC I and II understand twenty English statements. This programming language was used for typical business work, such as payroll and billing. In 1966, Hopper retired from the Naval Reserves, but was called back to active duty one year later. The navy wanted her to oversee a program to standardize its computer programs and their languages. One of the programs she help develop was COBOL. During her rise up the Naval ladder, Hopper had to convince a lot of people to change their habits. On a daily basis, she heard someone say, "but that's how we've always done it." Hopper believed that change was good, and needed. "I'm going to shoot somebody for saying that someday," she would quip. "In the computer industry, with changes coming as fast as they do, you just can't afford to have people saying that." To prove that things did not always have to be done a certain way, Hopper had a clock on her wall that ran counter clockwise. Hopper considered her greatest accomplishment to be all the young people she trained. She spent a lot of time lecturing and writing. Many of her analogies and examples have become legendary. Hopper is responsible for "debugging" the computer. She coined the phrase after finding a moth inside a computer. Once she used a piece of wire to represent a nanosecond. A nanosecond is the maximum distance electricity can travel through a wire in one-billionth of a second. She used this as a way to explain why programmers should not waste time, not even a microsecond. February 23, 1995: Keel Laid. January 6, 1996: Move aboard - Sail Around from Bath, ME to San Francisco CA. September 6, 1997: Commissioning. San Francisco, CA. - RIMPAC 98. 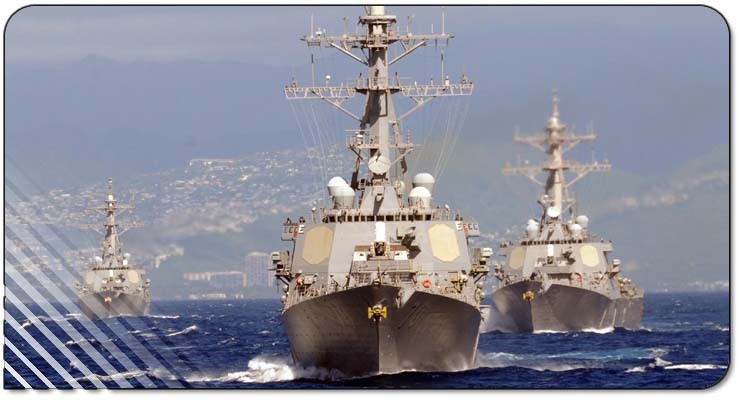 The Shield: Blue and gold are traditionally used by the Navy. 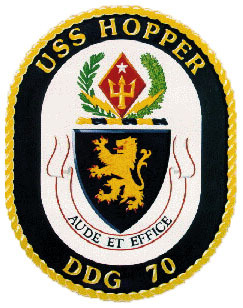 The lion, a symbol of strength and courage, stands for the USS Hopper's characteristics of survivability and alludes to the ship's motto ( DARE AND DO ). The rampant lion has been adapted from the arms of Scotland and refers to Rear Admiral Hopper's heritage. Gold stands for excellence; blue is for devotion to duty. The Crest: The lozenge, traditionally used in the coats of arms of women, honors Rear Admiral Grace Hopper. Her distinction as the first woman to achieve the rank of rear admiral is represented by the single silver star. The trident symbolizes her love for the United States Navy and her Naval service, the focus of her life's work. The lightning bolts, framing the bottom of the shield, connote the image of ship's hull cutting through the sea. They also represent the sophistication and power of the Aegis warship, in large part made possible by Admiral Hopper's pioneering work in the computer field. The wreath consists of laurel and oak representing honor and strength. red denotes courage and sacrifice; gold stands for excellence. Motto: The Latin phrase "AUDE ET EFFICE" translates into the English phrase "DARE AND DO", in context of a command. RADM Hopper was frequently quoted using this phrase when issuing advice. The phrase captures the spirit of RADM Hopper in her quest for pushing the limits of conventional thinking and looking beyond the norm for innovative solutions and approaches to problem solving. The simple phrase, in Latin, exemplifies the essence of Admiral Hopper's spirit while paying tribute to her tremendous academic achievements.